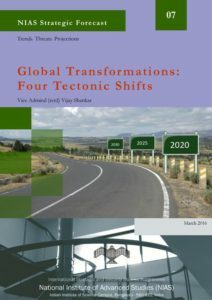 To get a deeper sense of the transformations that are occurring in contemporary global affairs one notes four tectonic shifts. First, the diminishing sheen in what was the dazzling two and a half decades of double digit growth which provided global impetus to economic activity and military sway of China; as it shrinks the danger it faces is a bellicose and fractious populace that may not any longer suffer an authoritarian dispensation without the enticement of unparalleled growth. Therefore, for China and its politburo, garnering resources and control over the instruments of growth becomes an imperative. This may, to some extent explain the urge to securing resources and its flow. Second, the fall and rise of Russia from a one time super power to that of ‘verge’ status attempting to salvage a little of its past with neither the economic clout nor the ideological resolve. This poses a uniquely prickly predicament for, within a period of a quarter of a century to have been reduced to pariah status and then rise amongst the verge powers with little to offer but its creaking arms industry, vast resources of primary produce in its icy wastes and a rapidly ageing demography. It need hardly be said that for Russia to view the changing challenges of the twenty first century international system in terms of early 20th Century great power struggles between governing elites emphasising hegemonic struggles, obscure imperial aspirations, competition for resources all to bolster state power is to brew a recipe for its second collapse. The re-emergence of Russia’s power status shrouds some astounding weaknesses. Above all its dependence on a petro-economy (30% of GDP and 80% of exports) at a time when oil prices are plummeting, grossly inefficient industrial base and declining living standard coupled with massive capital flight ($ 130 billion in2015 despite draconian anti flight laws) and the economy in recession. Russia could not have failed to note that challenges of the day are driven far more by people their energy, motivations, skills to globalize and network the instruments of wealth creation, urge to collective security and strategic effectiveness rather than raw military power. Recent wars in West Asia and Afghanistan have underscored the questionable efficacy of military power against even rag-tag militias equipped with little else than the internet, access to small arms and willingness to Jihad. About the Author: Vice Admiral (retd.) Vijay Shankar is an Adjunct Faculty at the National Institute of Advanced Studies (NIAS), Bangalore.